Oumar Abacar, 26, an ethnic Peuhl cattle herder at the home of the imam in Bossangoa. He came for supplies and to be treated for a gunshot wound at the local hospital but was killed by anti-balaka fighters one hour after this photo was taken. On Thursday morning, the photographer Marcus Bleasdale and I went to see the imam of Bossangoa, Central African Republic (CAR), at his home in the Muslim Boro district of the town. The situation in Bossangoa was tense as word spread of heavy fighting in the capital, Bangui, between the mostly Muslim ex-Seleka forces that now rule the country, and the Christian anti-balaka militias backed by defecting soldiers still loyal to the president ousted in March, Francois Bozizé. 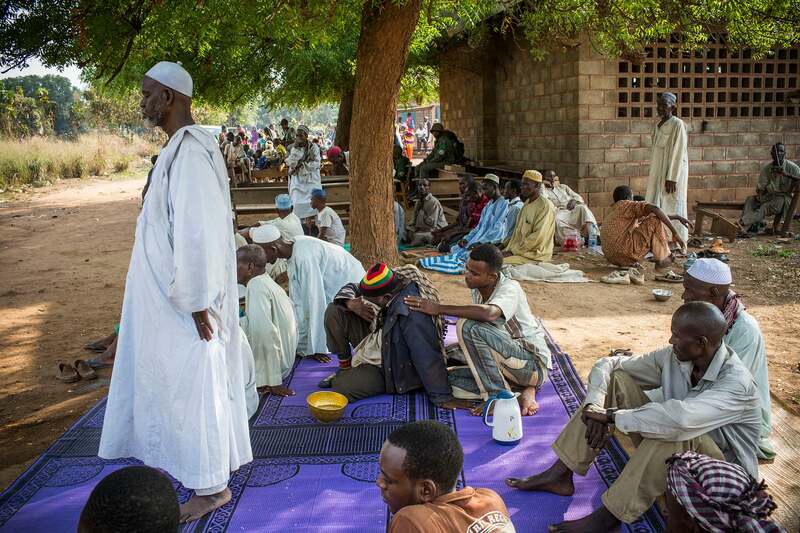 At the imam’s house, we met Oumar Abacar, a 26-year-old, bone-thin ethnic Peuhl nomad with a badly infected gunshot wound to his knee, barely able to stand. He told us that he had been staying at a nomad cattle camp north of Bossangoa when it was attacked by anti-balaka militias. “I was out in the bush with my two children,” he said in a voice barely louder than a whisper. “And the anti-balaka came and shot me twice with their homemade guns. They then left me there for dead.” On the way to Bossangoa, the anti-balaka attacked them several more times. Worried about his wound, we offered to take Oumar to the local hospital for treatment and a course of antibiotics. He was hesitant, fearful to travel into the Christian areas of Bossangoa, and worried about the rising tensions in the town. His mother told him to go, and said she’d stay around to look after him before they returned to the nomad camp several kilometers away. Oumar smiled and gave us a big thumbs up when he had his wound bandaged and got his medications. When we took him back to the imam’s house around 2 p.m., we noticed many of the shops were closing. As we were leaving, heavily armed Seleka fighters came flooding in on their pickup trucks, and we knew things were about to get dicey. By the time we reached the base of the Multinational Force of Central Africa (FOMAC) peacekeepers just a few kilometers away, everyone was running in terror for safety, and gunshots and explosions were happening everywhere. We and hundreds of frightened civilians had to hunker down at the FOMAC base for hours as anti-balaka and ex-Seleka fighters fought for control of the city, and FOMAC desperately tried to protect the civilian population from the fighting and sectarian massacres. Yesterday, as soon as we could move safely, we went to find out what had happened in the Boro district during Thursday’s fighting. We found the Muslim quarter deserted and partly burned, its entire population of some 7,000 residents and previously displaced Muslims sheltering at the nearby Ecole Liberté, heavily protected by FOMAC troops and the ex-Seleka fighters. When we found the imam again, this man who had already seen so much was too traumatized to speak coherently, and kept hiding his head in his hands. His friends told us the story of the tragedy that had unfolded, keeping their voices down to avoid traumatizing those mourning their dead just next to us. When the Christian anti-balaka fighters launched a surprise attack on the Muslim Boro district at 2 p.m. on Thursday – right after we had left the area – many residents had run to the imam’s house to seek safety. The anti-balaka fighters backed by well-armed army defectors proceeded to hack to death those who couldn’t escape. Eleven people were killed outside the house, including five women. We joined in the mourning. One of the men lowered his head, unable to make eye contact and whispered something that hit me like a punch in the stomach: “We’re sorry, but the two Peuhl you brought, the young man and his mother, they also were slaughtered.” With his badly wounded knee, Oumar stood no chance of escaping. Another old man arrived, and everyone stopped to say a prayer to the dead as he sat sobbing in their midst. I recognized the new arrival as a wealthy Muslim trader, Gara Iné, whom I had met last month after his cattle camp had been attacked by the anti-balaka, who had killed four Peuhl cow herders and stolen his 680 cows. He had introduced us to the Peuhl women who had witnessed the attack, and who had described to us how the attackers had killed all the men in the camp, cutting the throats of one woman’s 3-year-old son, two teenage boys aged 10 and 14, and the other woman’s husband. Now, more tragedy had befallen Gara. His wife, Khadija, 35, and his brother-in-law Adei Abacar, 38, were among those whom the anti-balaka had hacked to death with machetes outside the imam’s house. Khadija’s elderly mother, Hamida Oumar, was in critical condition at the local hospital, with severe machete wounds to her head. We offered our condolences to Gara, remembering how he had kindly hosted us on our previous visit. As we walked back to our car in silence, we found a young Muslim boy, Zakaria, with his arm in a sling – we had briefly run into him that same morning at the hospital, when we had seen the Seleka fighters come to collect the body of one of the nine ex-Seleka fighters killed in Thursday’s fighting. Zakaria had another horror story. He told us that he had been inside his home in the Muslim district when anti-balaka fighters and heavily armed army defectors burst in and shot him in the shoulder and arm, leaving him for dead on the floor. As he lay there unconscious, the attackers looted his family’s home and then the thatch roof on fire. The heat from the fire made him regain consciousness, and he had managed to escape just in time. The gruesome events in Boro district of Bossangoa present only one small segment of a much broader tragedy that has been unfolding in the Central African Republic. 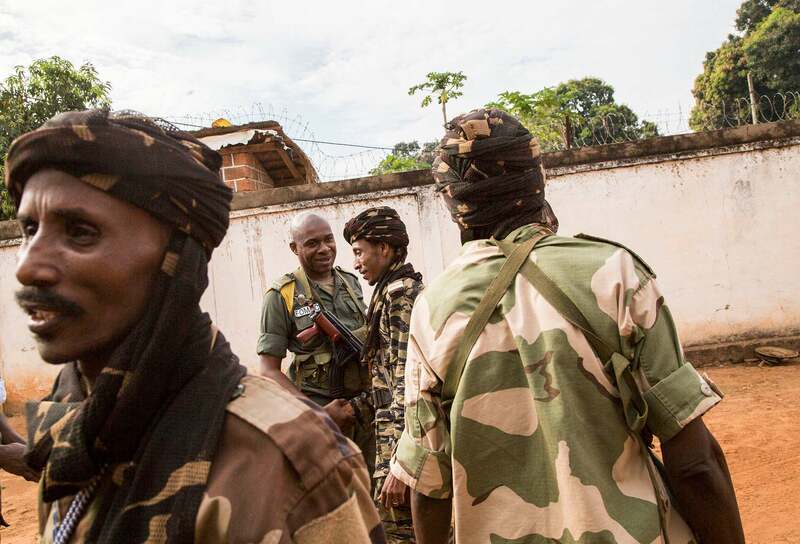 Since overthrowing the government in March, Seleka forces, an alliance of predominantly Muslim armed groups, have ruled through the gun and with terror, attacking and burning down Christian villages, killing and wounding untold numbers of people. Hundreds of thousands have fled their homes in fear, creating a humanitarian crisis. Future atrocities are in the making. On Friday morning, after anti-balaka militias had chased his forces from much of Bossangoa, Seleka commander Colonel Saleh took his regrouped fighters to the outskirts of the Catholic Church camp that housed some 35,000 displaced Christians. His men then fired several rocket propelled grenades into the crowded camp, and repeatedly threatened to attack it unless the anti-balaka left Bossangoa. Hoping to avoid a massacre, the African peacekeepers negotiated an end to the crisis and got the anti-balaka to stand down, knowing that Colonel Saleh would have no second thoughts about launching a full-out attack on 35,000 civilians. With between 400 to 500 dead in similarly brutal clashes and massacres since Wednesday in Bangui, where many of the corpses still laying uncollected in the streets, little doubt remains that the Central African Republic stands on the precipice of ever-widening sectarian bloodshed. France knows how critical the situation has become, sending hundreds of additional French troops to the country to provide civilian protection, but it is still struggling to find support for a broader international stabilization force for the country under United Nations command. No French troops have yet arrived in Bossangoa. There is no more time to be wasted to avert a disaster.